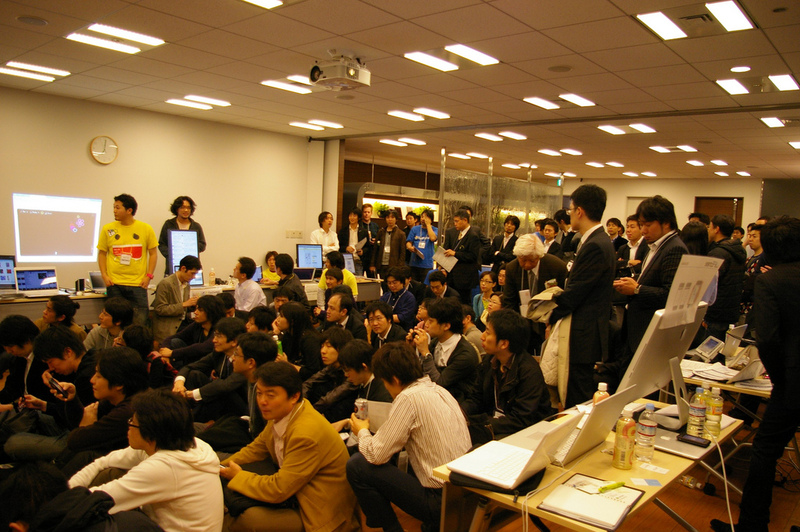 A total of 19 Japanese startups were given the chance to show their services at TokyoCamp, a demo event held by TechCrunch Japan (one of the country’s biggest blogs) this Friday. The event, which was co-organized by hosting company KDDI Web Communications, was a blast and attracted over 200 people this time. Launched by Tokyo-based Exchange Corporation in December last year, AQUSH is a peer-to-peer lending service that is similar to ZOPA in the UK. AQUSH aims to unlock some of the more than US$7 trillion of retail cash and bank deposits (that are earning nearly 0% interest) by offering individual investors access to the US$300 billion Japanese consumer loan market. Lenders set their desired investment amount and interest rates from 4% to 15% for 5 classes of borrower credit risk, as denoted by AQUSH itself. AQUSH loan applicants are screened based on their credit histories, financial situation and FICO scores. The service has been in operation for 2 months and so far the average annualized ROI for investors is 10.58% after fees. AQUSH says for borrowers, interest rates range between 25% to 50% cheaper than available from specialized consumer lending companies. If you can read Japanese, there’s an in-depth (and fairly recent) article on AQUSH on TechCrunch Japan. Japan is business card country, which means that your average salary man collects hundreds of these cards in any given year. Maysee is a service that scans business cards for clients, corrects OCR errors manually and makes the data accessible via PCs or mobile phones through a web app (for $20 per month per user/$0.35 per business card). The company is currently looking for business partners overseas. Sketch Piston is the name of a “new game genre” created by Tokyo-based Team Lab. There are two “Sketch Action” games available at the moment, Sketch Piston 3 and 4 (both of which were made for Team Lab clients). Players can interact with characters in the Flash games by “sketching” various objects with a virtual pen, stamp and eraser. The games have no goal per se, but users can make and share creative gameplay videos on a dedicated platform. Cacoo is a what appears to be a powerful online drawing tool that allows multiple users to create designs collaboratively and in real-time. The designs can be shared with certain users or published on the web, for example on blogs or wiki sites. If you make changes to the designs in Cacoo, the blog or wiki the designs were pasted into gets updated automatically and in real-time, meaning there is no need for another upload. Mainly made for technical illustrations (wireframes, software design diagrams, network diagrams, UMLs etc. ), Cacoo is completely browser-based, free and available in English. Link Knowledge is an SaaS solution with a focus on CRM and SFA (sales force automation). Much like Maysee (profiled above), Link Knowledge digitizes information found on printed business cards, puts the data into context and stores it in the cloud for customers who can then access their data from anywhere they want. Wishcovery aims at matching people who have the right skills with those who have uploaded requests or project proposals on the site. The service is scheduled to launch in alpha in April. TechCrunch Japan covered Wishcovery just last month after it won the “TechCrunch Japan Award” at the first Startup Weekend Tokyo event. Dubbed “social translation service”, Conyac is actally based on a virtual currency called “Conyac Points”. The way it works is that “requesters” need to pay a certain fee upfront, upload a text and indicate which languages the text should be translated into. Registered translators (who don’t need to get screened or examined) translate texts they think they can handle to earn Conyac points. Those points can then be converted into real money via Paypal, with the service itself getting a 20% cut. TechCrunch50 demopit company LIFEmee presented a revamped version of their eponymous life management service that will go live early next month. Expect less clutter, a simplified UI, fresh features (i.e. a scheduler) and a new mobile version (scheduled for release next month). Mangaroo is a free, social manga service that allows comic artists (amateurs and professionals alike) to upload and share self-created works with other users. Readers can just read the comics, leave comments, bookmark their favorite manga or rate them. 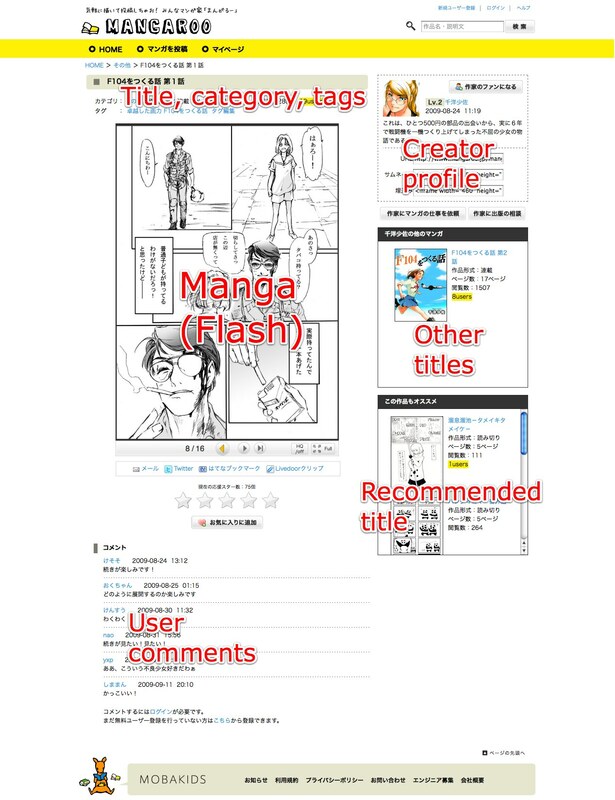 Each manga is based on Flash and can be embedded in other websites. meme memo is a free, Flash-based “pin board” that can be covered with “virtual Post-its”. Each user can set up to ten pin boards (folders) and embed up to 1,000 Post-its (“cards”) to scrape, organize and share various information. Some cards require work by the users themselves (i.e. the ToDo card or the address book), but others get updated automatically once you add them to your folder (i.e. the Twitter card or the RSS card). Apart from pure text, it’s also possible to add videos (YouTube card), images or audio files to the pin board. 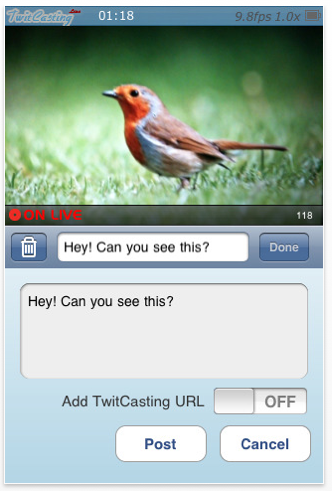 As one of the few iPhone apps that were shown at TokyoCamp, Twitcasting Live (iTunes link) is a free Twitter client that lets you broadcast (video and audio) live through your Twitter account. The app splits the iPhone screen in half: You can see what you currently broadcast on the top and access your Twitter timeline on the bottom. When you start the recording, Twitcasting tweets a link to your followers who can watch the live broadcast on their PCs or iPhones. The app works with both 3G and Wi-Fi and supports the 3G as well as the 3GS (click here for a demo video). Let me explain the name first: Bang Me! is a wordplay of sorts on the Japanese word for “program” or “show”, which is pronounced “ban-gu-mi” (seriously). Provider DigitalNomad is marketing the downloadable software as a dead-simple video editing tool for beginners or online businesses that don’t have the budget to produce flashy promo videos. Bang Me! was featured on TechCrunch Japan last month and appeared to be much better than the name suggests (I was told they will change it when the software goes on sale internationally). In case you ever stumbled upon a flower whose name you either forgot or were interested to know, Hanashirabe is the solution for you. Just upload a picture of the flower in question, crop it, specify when you took it and the “flower recognition engine” will reveal the name of the flower in a heartbeat (demo video). Pitched as “Yammer for private use”, Talknote is a micro social communication service that has yet to launch. The main selling point of the service is that it enables multiple users to text-chat across a number of different devices – virtually in real-time. Talknote will be the first service that allows iPhone users to communicate with owners of regular Japanese handsets this way (PCs, Symbian, Blackberry, Android etc. will eventually be supported as well). The conversations are stored as “talknotes” and can be accessed again anytime later. I was able to play around with the iPhone version, which looked pretty nifty already. Presented for the first time at TokyoCamp, Qlippy is an iPad application that extends to the web in the form of a social network for book lovers. The app will let users download EPUB-based ebooks off the web to read on the iPad. Provider SpinningWorks says readers will also be able to clip pictures or texts on the iPad to create their own scrapbooks. 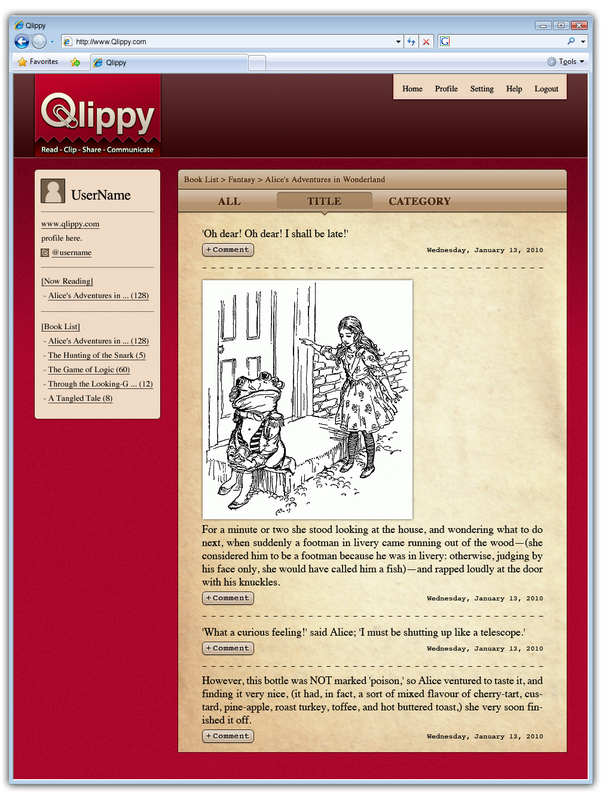 The clipped elements and scrapbooks can be shared with other people on the Qlippy website (demo video). Korean transplant Dong Yol Lee has presented a very early version of waarp, his 3D audio augmented, “eyes-free” social network system that eliminates the need for a visual UI. Video Analytics is a freemium-based “Google Analytics for video” that’s especially geared towards e-commerce and education sites. The tool helps to analyze how visitors view videos by breaking down which keywords from search engines are the most effective, how many times a certain video was accessed, how many users watched it from beginning to end, at which points users pushed the stop button etc. All data is visualized online through a Google Analytics-like dashboard. mindia wants to be the online “encyclopedia of your mind”. The main idea behind the service is to provide a platform for people to share their viewpoints on any given keyword with the world (in Japanese, at least). Unlike Wikipedia, mindia encourages users to post what they personally think and makes all discussions public, with every member having a specific profile page (example). In other words, mindia is like Wikipedia with a social network built on top of it. The platform is free to use, but there’s also a solution for enterprises. Tokyo-based startup Glucose presented three Twitter apps for the iPhone. Fastweet is one of the many, many Twitter clients out there and is available in the App Store as a free version (which stores just the latest 200 tweets) or as Fastweet 2K (for $1.99), which keeps the latest 2,000 tweets. Fastweet Live (iTunes link) is a good solution if you search for specific keywords or hashtags. The app then displays just the relevant tweets dynamically, which makes sense during an event or if you want to stay informed continuously on a current hot topic or a specific news item (demo video). The next TokyoCamp will probably take place in April. Thanks to all attendees, startups and co-organizer KDDI Web Communications, and a sorry to the many people who couldn’t make it on the guest list this time! Go to TechCrunch Japan’s Flickr account to see more pictures of the event.